It´s summertime! Even if June seemed to be autumn in Basque Country, we finally saw the sun, and last weeks we´re having good weather. 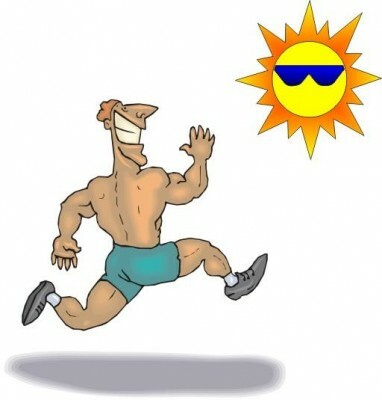 Even if runners are ready for any kind of weather, I must say that I prefer sunny and hot days more than winter days. - Early in the morning or late in the afternoon. Those are the best moments for having a nice run. When sun is hidden it´s easier to avoid heatstrokes, dehydration, injuries and getting too tired, and you´ll enjoy it for sure! - Look for water sources. After getting well hydrated before starting to run, plan your run and try to end it near a place where you can drink some water. This way you´ll refresh yourself and you won´t have to wait until you go back home. Isotonic drinks are also good, and eating some fruit with a yogurt can be also a good option. If you have been running for more than an hour, there´s nothing better than a pasta salad! - Protect against blisters. In hot days, clothes and shoes touch your skin and it can result in blisters and wounds. That´s why you should look for some adhesive bandages or band aids. Also non-sewing clothes are good to prevent from those kinds of injuries, and vaseline is very useful for some parts of the body where wounds use to appear in summer. - One skin, one life. The advices we´ve given before are really important. Blisters are painful, lack of water can be deadly and heatstrokes are also bad. But those facts are so obvious that we keep them under control quite easily. However, one of the most important advices that we usually forget is to protect our skin. As the outer covering of our body, skin is the largest organ that we have. It´s very sensible, and runners usually expose it to sun without any kind of protection. Even covered skin needs protection. Long and short runs under the sun or even a cloudy sky are the perfect situation to get burnt, and these fact can provoke very serious problems such as dry skin, sunburn and wrinkle, which can end up in a skin cancer in a long range of time. Because of that, we must use sweatproof sun screen and proper clothes to cover our skin. This way, sweating won´t reduce sun screen´s effect. And keep doing this even if it´s a cloudy day, because UV rays can go through the clothes and damage your skin! There are lots of kilometres to run but only one skin to use in this life. Enjoy running safely!